Illustrations from Apples of New York. Thurlow led Bunk to the abandoned intersection that had once been the heart of Fletcher Town, pointed to an ancient, gnarled tree, and said, "That's the tree I used to eat apples from when I was a child." The tree was almost entirely dead. It had lost all its bark except for a two-inch-wide strip of living tissue that rose up the trunk and led to a single living branch about 18 feet off the ground. There was no fruit, but Bunk was interested. A few months later he returned, took a handful of shoots, and grafted them to rootstock at his farm. A year later, both Thurlow and the tree died, but the grafts thrived, and a few years later, they bore the first juicy, green Fletcher Sweet apples the world had seen in years. "It's a great apple," Bunk says. "It has a super-duper distinctive flavor." Today, Bunk has returned young Fletcher Sweet trees to Lincolnville. The apple detective, John Bunk, runs a nursery that preserves and sells heirloom apple varieties. An excellent flavored apple of the Green Newtown type in season during late fall and early winter. It is not as good a keeper as Green Newtown. Raised from seed of the Newtown about 1830 by a Mr. Slingerland of New Scotland, Albany county, N. Y. (i, 2). Fruit medium to large. Form roundish, often oblique. Stem exserted but short. Skin yellow splashed with reddish-orange over the base. Dots minute. Calyx small to medium, partly closed. Core small. Flesh whitish tinged with yellow, firm, tender, juicy, brisk, rather rich subacid, good to very good. Season December to February or later. Downing describes a variety under this name" which originated in the town of Bethlehem, Albany county, N. Y. He states ( i ) that the tree is productive, the fruit above medium size, pale yellow mostly overspread with deep red, pleasant subacid and good in quality for culinary uses ;	season September and October. We do not know this variety and have found no account of it except that given by Downing. Last year's apple crop took a big hit from the early spring (and subsequent frost). Let's hope for a better crop this year -- and unusual apples. * We ended up roasting some of the Russets with cauliflower and onions for a soup. We still think about that soup. The most unusual heritage apple I've ever eaten was the Sheep's Nose, which I bought at Indian Ladder many years ago. My then neighbor Peter Ten Eyck was growing some heritage apples at his orchard. When I picked out a basket of Sheep's Nose, he kind of paused and said "Have you ever had them?" No, but I was game. Supposedly the name comes from the apple's shape looking somewhat like a sheep's nose. However I think it's because the apple must taste like a sheep's nose. A poor eating apple and while it's supposed to be a good apple for cooking and desserts, the applesauce I made from it resembled mashed potatoes. There is a reason why some heritage varieties die out. There are several useful things about heirloom apples. In addition to a wider variety of flavor, texture, acidity, and tannin content, heirlooms also offer genetic diversity. 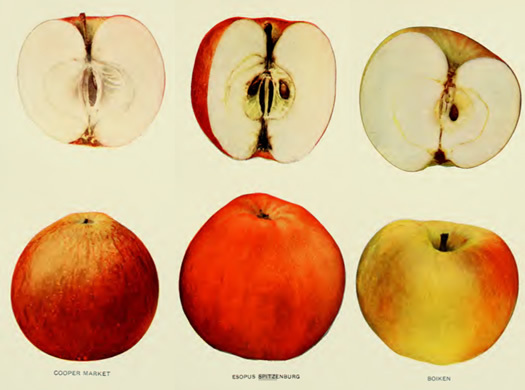 The few varieties grown commercially descend mainly from about six different apples, some of which are quite vulnerable to climate and disease. Heirlooms offer greater choice in climate requirements and disease resistance, and diversifying the genetic stock can protect us from future apple disaster.